I am sure that we have all felt the terrible pain when our beloved pet and companion makes their journey over the Rainbow Bridge. 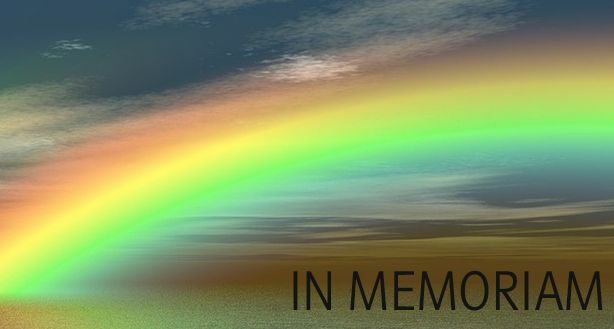 We all deal with this sad loss and grief in different ways and the healing process takes time. However it does get better and in due course we are able to look back with fondness at the many happy times we spent together. Regular visitors to the Sanctuary will have seen the ongoing project of the Memorial Garden. Thanks to the hard work of Pam and our other gardening volunteers, together with generous donations from friends and local companies, we now have an area where flowers abound and the space has been transformed into a calm oasis. Within the confines of the garden we have erected a Memorial Wall. 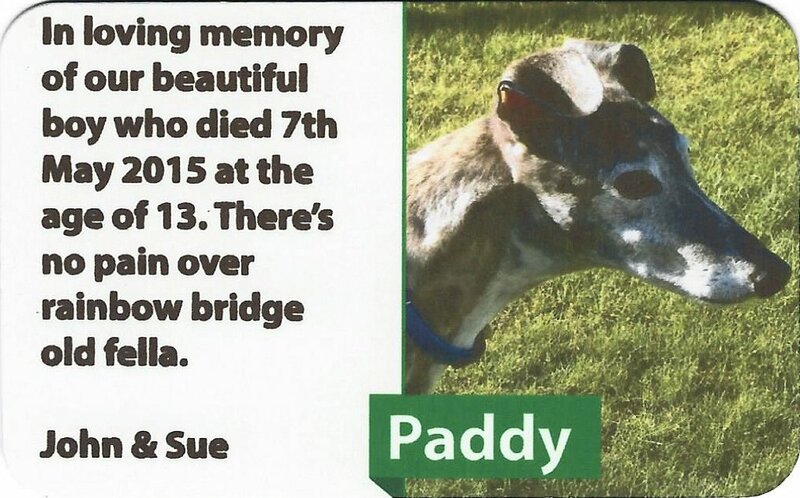 It will now be possible, should anyone so wish, to place a dedicated plaque on the wall to act as a token of remembrance for their departed greyhound. Also if desired the ashes can be scattered over the garden. An example of the plaque style is shown below. It measures 85mm x 53mm and can contain a photograph of your pet and up to 150 characters (letters, including spaces). 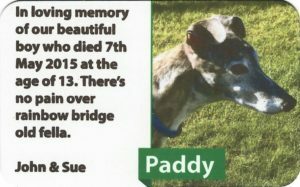 And thanks to John and Sue for sharing their plaque which they have commissioned in memory of “Paddy”. We have been helped in the preparation and supply of the plaques by one of the companies who undertake work for us on a regular basis and they will supply them for £25. A draft of the plaque layout can be supplied before the desired version is finalised. If you would rather just scatter ashes on the garden then of course that is fine and if you contact us first we can ensure that someone will be available to help you at the Sanctuary. Hopefully this will enable us all to come to terms with our loss and speed up the healing process so we can look back with joy at the wonderful times we had together with our dogs.